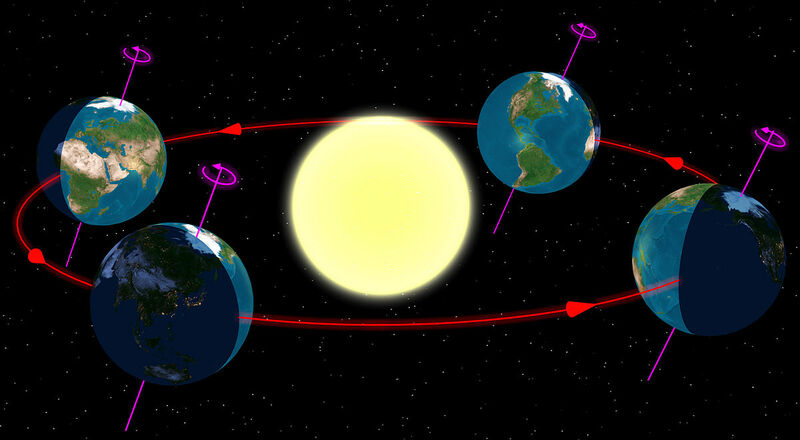 The word ‘solstice’ comes from the Latin solsitium, or ‘sun stands still’ – the day when the sun appears to stand still as it reaches its highest point in the sky, an illusion which occurs because the Earth’s axis is tilted as far as it goes toward the sun on that day. In ancient times, the festival associated with the summer solstice was primarily a Celtic fire festival, representing the shortening days as they gradually headed back towards winter. The ancient ceremonies revolved around beliefs in the power of the sun, which was often revered as the sun god. People would flock to join in with the all-night festivities whilst awaiting the first light of dawn. Midsummer bonfires were lit in the belief that they would add strength to the sun’s energy. In some areas of Scotland, Midsummer fires were still being lit in the countryside well into the 18th century. At Stonehenge, the sun rises over the ‘Heel Stone’ and is framed by the great trilithon stones of the main entrance. These pictures from my Stonehenge post show the Heel Stone and trilathons (megalithic structures consisting of two upright stones and a third across the top as a lintel). The Christian Church designated June 24th as the feast day of St John the Baptist, and in the U.K, from the 13th century onwards, Midsummer’s Eve became known as Saint John’s Eve, though it was still celebrated by feasting and merrymaking, and the lighting of great bonfires. 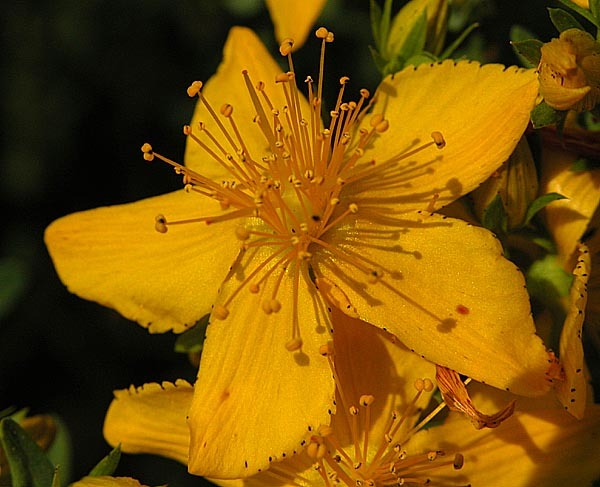 St John’s Wort was traditionally gathered on this day as it was thought to be imbued with the power of the sun, and several other plants were also thought to be more potent at this time. Such flowers would be placed beneath pillows in the hope of wonderful dreams, particularly about future lovers. Like that of many festivals, St John’s Eve was seen as a time when the veil between this world and the next thinned and powerful forces were free to wander. Careful watch was kept during the night and it was said that if you spent a night at a sacred site during Midsummer Eve, you would gain the powers of a bard (poet). But, it was also thought that people could end up totally mad, dead, or be spirited away by the fairies. Shakespeare’s Midsummer Night’s Dream is based on the idea that fairies were about and at their most powerful on this night. The summer solstice is still important to pagans today, and many of them celebrate it at great sites like Stonehenge and Avebury. Some head for other stone circles and ancient monuments or hold small ceremonies in open spaces … everywhere from gardens to woodlands. For witches the solstice forms one of the lesser sabbats – or sections of the wheel of the year – their main festivals being Beltane and Samhain. Stonehenge is always the most popular site at both the summer and winter solstice, and there are several videos on YouTube for anyone interested. This video gives a very brief look at the summer solstice sunrise at Stonehenge in 2015. I haven’t added the actual video to my post because I’ve no idea about copyright – and I really don’t fancy a massive fine! Though many of the original traditions no longer exist, some were brought back during the 20th century. 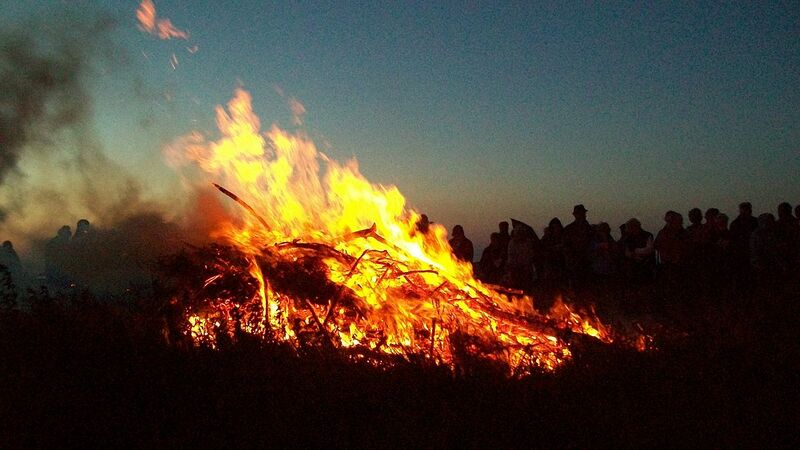 Midsummer bonfires are still lit on some high hills in Cornwall, a tradition that was revived by the Old Cornwall Society in the early 20th century. Naturally, different countries have their own traditions, and this post would go on forever if I attempted to work through them all. The many Midsummer celebrations held in the United States are mostly derived from the cultures of immigrants who arrived from various European nations since the 19th century. I’ll finish with a quick word about Scandinavia, where the festival of Midsummer is celebrated as much as Christmas. 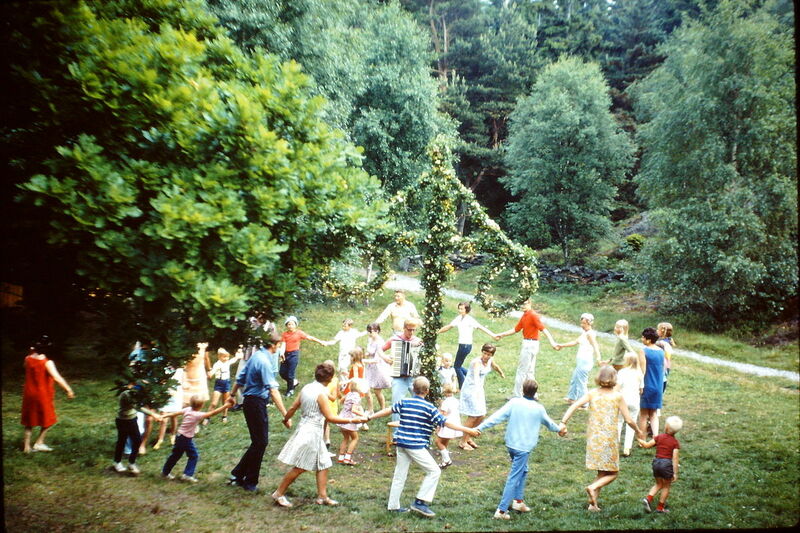 In Sweden, it is a national holiday called Midsommar. Houses are decorated inside and out with wreaths and flowers and people then dance around a decorated midsummer pole while listening to traditional folk songs known to all. As in many other countries, the Midsummer festivities include bonfires and divining the future, especially one’s future partner or spouse. How wonderful, no one around here celebrates the solstice, I have my own little celebration. Tonights solstice with the strawberry full moon is a rare occurance and very exciting. I didn’t mention the strawberry moon in my post – I just forgot about it, to be honest. It seems we haven’t had one since 1967. I didn’t realise till I heard it on the news yesterday, that it was given that name by native Americans. Because it was the first full moon in June and signalled the start of the strawberry-picking season, which June is in the UK, I assumed it was a British name. You live and learn, as they say. Since I couldn’t make it to Stonehenge for the ceremony which I think would be wonderful. I put some wood in my fire pit, lit some candles, had some wine and watched the beautiful full moon. I played appropriate music and set my stones/crystals out to soak up the moons energy after cleansing them. It was peaceful and calming and beautiful. Today is Summer Solstice, it is so mild and pleasant here today. Thank you for the beautiful text and pictures. Today has been lovely here today, too, which is a nice change, after yesterday’s heavy rain. Thank you, Holly. Never heard of this prior to your post Millie. Your stories are fascinating and so beautifully written. We don’t get to celebrate over here, but l’ve always like reading about it and anything that has to do with the Universe. A very lovely festival! It can be good to visit! It sounds like spending a night at a sacred site during Midsummer Eve is a bit of a risky proposition, it could go either way! This is so special and interesting! I loved viewing the moon last night it was lovely! Thanks, Lynn. Funnily enough, I’d never heard of a strawberry moon until this year. Thanks for sharing all of this. I love to learn more about the traditions although I probably have already heard about most of them all the way back in school. Stonehenge is definitely a place I would love to visit one day. I loved the background and info you provided and not just the photos! Great stuff! Thanks, Jason. I’ll be getting back to you about my books in the next couple of weeks. Sorry for this late reply. This is the first time I’ve been on my blog for almost two weeks, and am just responding to comments now. A fun tradition to learn about! BTW, haven’t seen you around in awhile…come, visit, have a read, and post a comment or two! Thanks Jacob. I’ve been away from my blog so much this year, and owe so many of my blogging friends a few visits. I’ll be sure to visit you over the next few days. I’ve been busy with my writing, you see. Now I’ll be catching up with blogging! Oh the Midsummer bonfires of my childhood! The best memories. Really? I’ve never been to one. I can imagine the atmosphere at those events is wonderful. Thanks, Inese. Sorry for the late reply – I haven’t had time for my blog for the last two weeks. I hope to do a little catching up over the next week. Hi Inese. 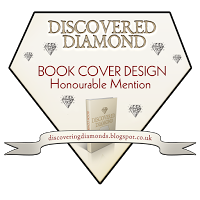 I’m struggling to find time for my blog at the moment, with two books to write. I would normally agree with you about summer, but our summer has been awful so far this year. Today has been really horrible – heavy rain, strong winds, hailstones and thunder, all in one day. We had better weather in winter! Millie, this weather is the best for writing, because you don’t want to go outside at all 🙂 Here is the same, another winter. Wishing you loads of inspiration! Still waiting for the summer…..! Pleased I ended at the Ridgeway not only because of my toes but also the inclement weather…..! I did the walk over six consecutive days and that is the Ridgeway ticked! I will do Hadrian’s Wall either a little later this year or next year but I shall do it for myself with no charity involvement. Tobe honest I am glad I had decided to split the two walks as I would never have managed them with the pain from the toes! Congratulations on finishing the walk! Take care of yourself and I really hope your new business gets off to a flying start. Now I know something I didn’t know before, that the word ‘solstice’ comes from the Latin solsitium, or ‘sun stands still’. I believe you don’t need to be a pagan to enjoy the sunrise at Stonehenge. 🙂 Lovely post, Millie. I really enjoy how you cover how so many different groups celebrate this holiday. I wonder how many other cultures through time celebrated it, given how apparent the natural phenomenon is to anyone paying attention, and what they did. I wouldn’t be surprised if they, too, celebrated with bonfires and dancing around poles. It occurs to me that I could use more bonfires and dancing around festively decorated poles in my life! Oh yes, there’s nothing like a good bonfire and dancing round poles to give that feel good factor. I think the thing is, that they’re all such community activities. When people get together to celebrate these occasions it makes it all so special, and so much fun. The idea of the sun as a god can be seen in so many ancient cultures. It’s to be expected, of course, given that people recognised that the was all powerful and nothing would survive without it. 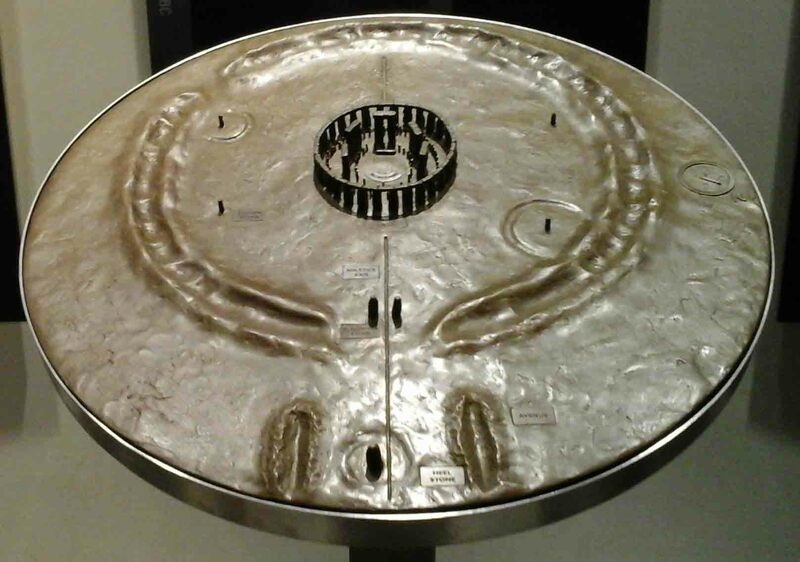 Very interesting… have a look at my Blog; Summer solstice down-under… it might blow you out. Hello again. I’ve been trying for a while to log into your blog so I can comment. Unfortunately, I couldn’t get in, either through my WordPress user name or my email address. Just to check, mu daughter tried with her WP address and she couldn’t get in, either. Sorry.